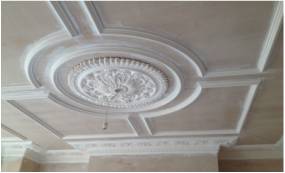 Plaster is a mixture of lime, gypsum and water, re-enforced with hessian fibre that hardens to a smooth solid stone and is used to cast or craft plaster mouldings for decorating the walls and ceilings. Most common known as Plaster of Paris. See also our guide how to install plaster coving and ceiling roses.